This handsome bird was chosen as the state bird in six states (Kansas, Montana, Nebraska, North Dakota, Oregon, and Wyoming), almost certainly for its rich, bubbly song, which can be heard in the soundtrack during the iconic hitchhiking scene in the movie It Happened One Night. In areas where its range overlaps with the Eastern Meadowlark, the song is usually diagnostic, though I once heard what sure looked like one bird sing both songs, in Port Wing, Wisconsin. 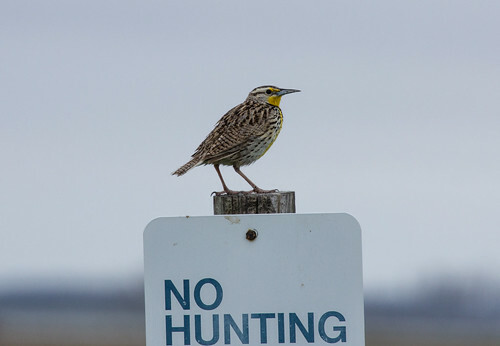 Although the birds look almost identical, the Western has a yellow malar stripe between the yellow throat and white cheek; the malar stripe in the Eastern Meadowlark is white. You can see a great comparison at Cornell’s All About Birds page.